Hookpad (by default) shows only the notes and chords in the song’s key, coloring each note to denote its musical function. 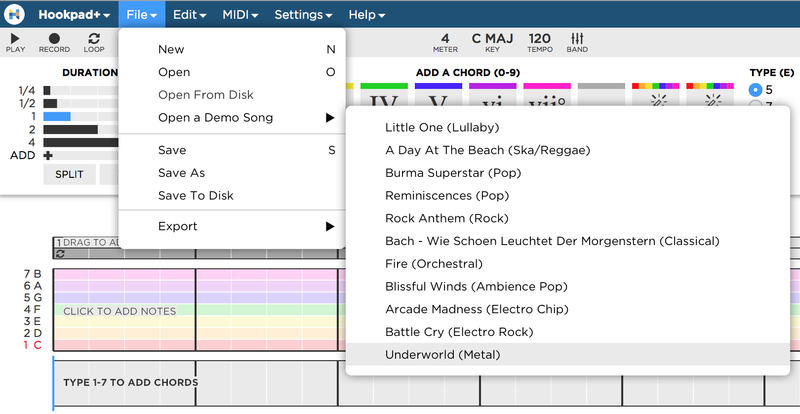 Hookpad also knows about chords and shows which ones are likely to work in your song. Based on the other chords in your progression, Hookpad can suggest where to go next and can provide a guide for what notes might sound good in the melody above each chord. For someone who’s never written music before, Hookpad can be a revelation. We’ve been told “it’s like Legos for music”. With Hookpad, literally anyone can write a song. Hookpad is used in 100s of schools around the world and by serious musicians and composers of all genres from classical to EDM, pop, and rock. Here’s a live demo walking through what Hookpad can do when you combine the more complex harmonies it is capable of with its new advanced sound engine. Type 1-7 in the chord and melody regions to get started.